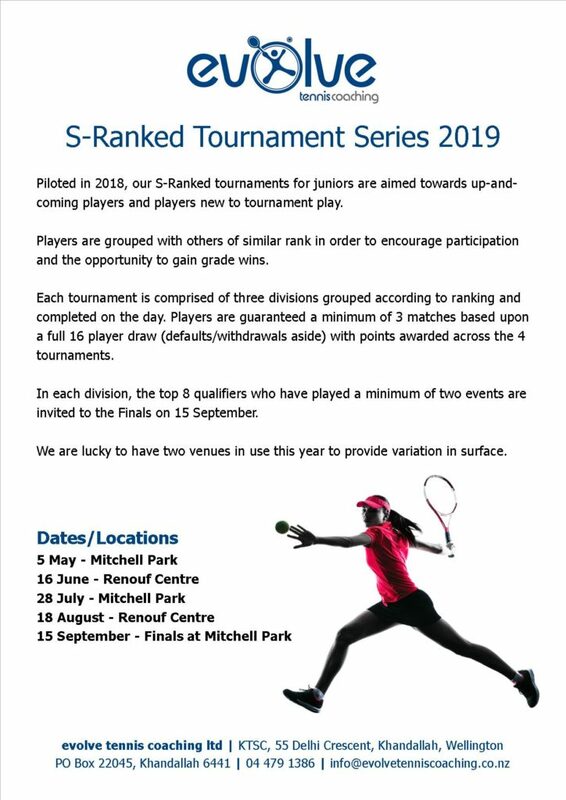 Congrats to all participants in our S-Ranked tournaments in 2018. A special mention to everyone who qualified for the Finals. From left: Division 1 Winner, Luca Campbell & Runner-up, Tony Lai. Division 2 Winner, Elise Hendry & Runner-up, Jacob Lane. Division 3 Winner, Nathan Willoughby & Runner-up, Mia Campbell. 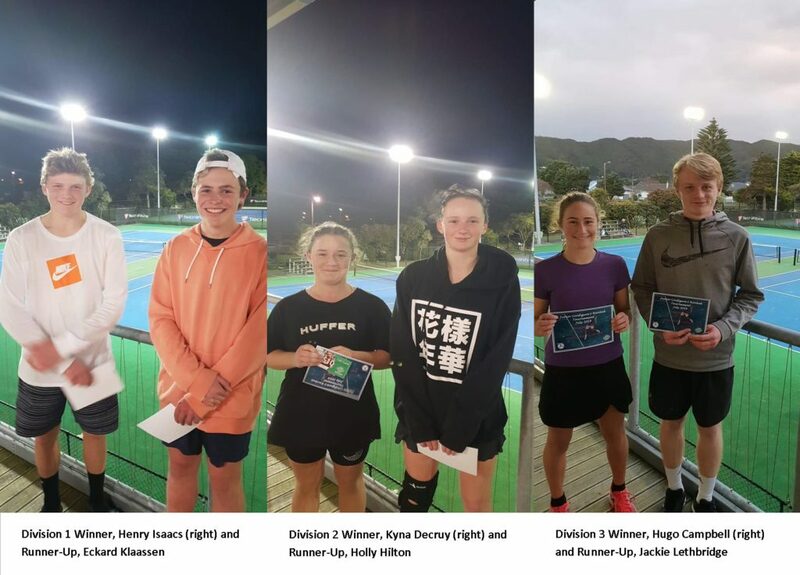 From 13-16th July, Evolve Tennis Coaching took a group of 8 players to the Marlborough Junior Open in Blenheim with 3 further Evolve players meeting us there. 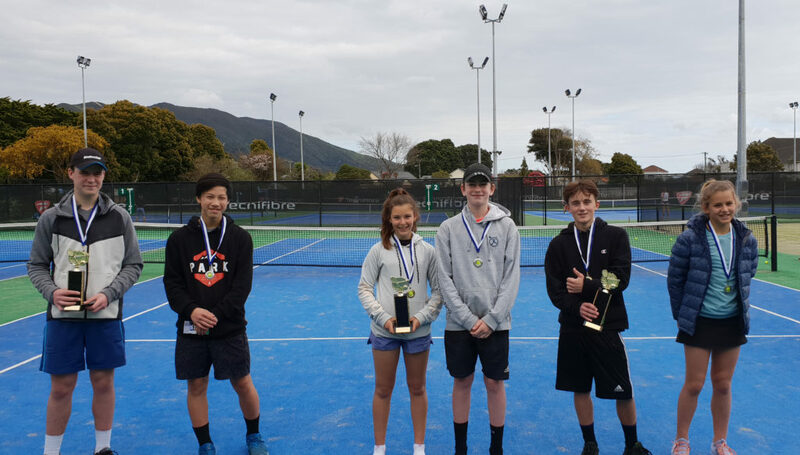 The weather was fantastic and we achieved some awesome results with Elise Hendry winning the U14/U16 girls and Josh Fisher winning the boy’s U14s in a straight final against Hayz Davis. Amelia Cave came 2nd in the U12 girls, Sophie Cave came 3rd in the u14/u16 girls and Eckhard Klaassen came 4th in the U16/U18 boys singles. In the girl’s U14/U16 doubles Elise Hendry and Olivia Leask came in 1st place, Jackie Lethbridge and her partner came 3rd and Amelia & Sophie Cave came in 4th position. In the boy’s U16/18 doubles Eckhard Klaassen and Jackson Barr finished a well-deserved 2nd. In the evenings we watched the Wimbledon semi finals and final, and entertained ourselves with some fun group games. On the last day the group went tenpin bowling before heading back on the ferry with very smooth sailing all the way. A great time was had by all and thanks to everyone involved. The second tournament in our S-Ranked Masters Series was held on Sunday 10 June. Thanks to everyone who participated and made the day a great success. The final two events will be held on 29 July and 19 August with the finals to be run on 2 September. Please get your entries in as soon as possible by clicking the dates above to avoid missing out! Once again, we are running a tour to the Australian Open & Hume Tennis Centre in January 2019. Melbourne Park to see the worlds best players in action at the Australian Open. 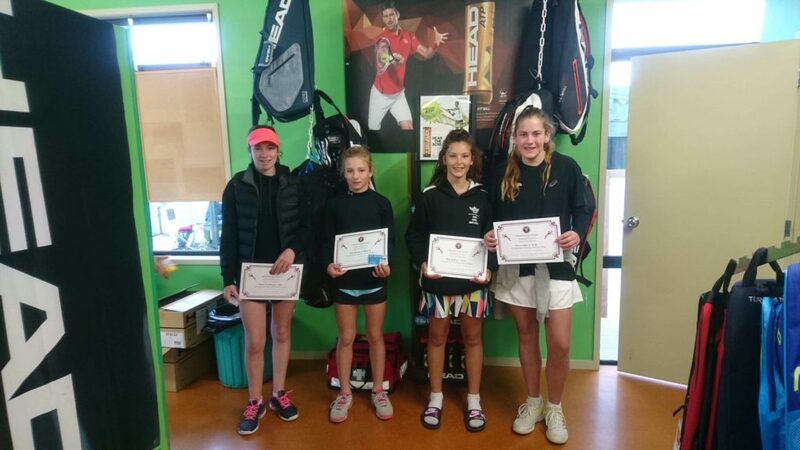 If you wish to register your child, please complete the registration form by Friday 29 June and email it back to us at info@evolvetenniscoaching.co.nz. To fundraise for the tour, there will be catering opportunities at our S-Ranked Tournaments on 10 June, 29 July and 19 August. From 13-16 July we will be running our annual tour to Blenheim for the 2018 Marlborough Junior Winter Open. 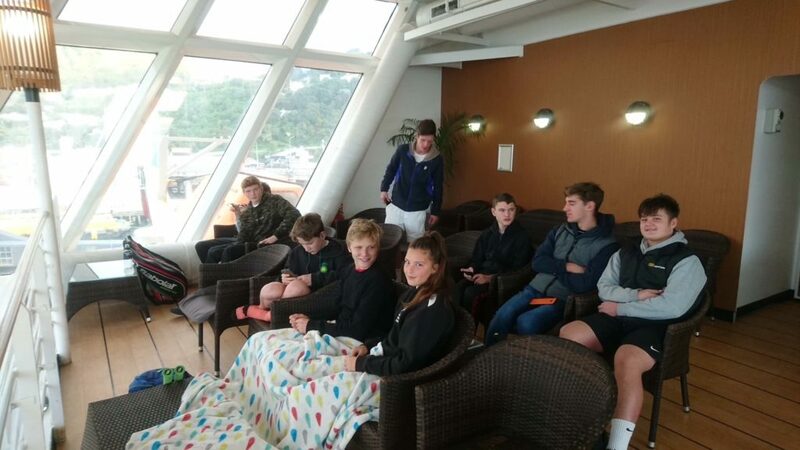 The tour gives our players the opportunity to compete against players from another region and gain those valuable grade wins… as well as get a look at the habits and travelling routines of a professional tennis player! 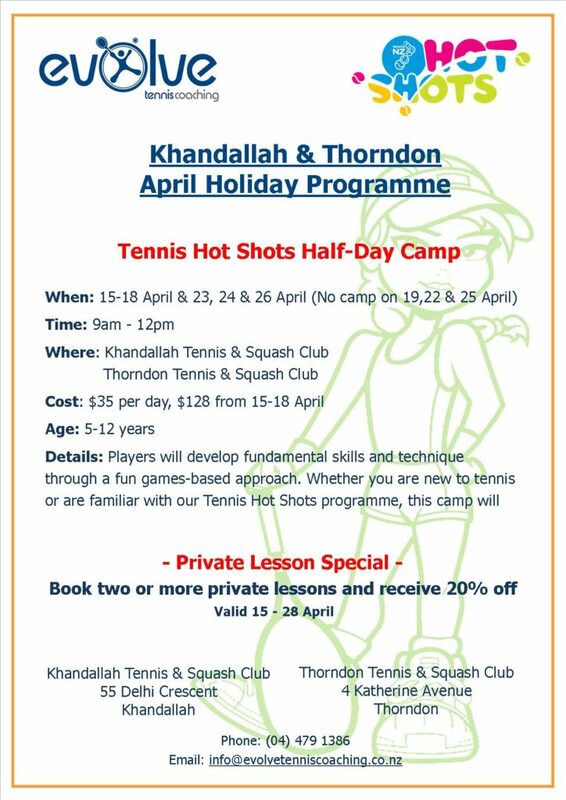 To register your child, please complete & return the attached form to info@evolvetenniscoaching.co.nz by Friday 1 June.